I can eat an entire jar of kimchi by myself in a week, and often do. I can also eat my weight in vegan cheese if given the chance. So for me, mixing the two was a no brainer, and so I introduce to you KIMCHEESE! 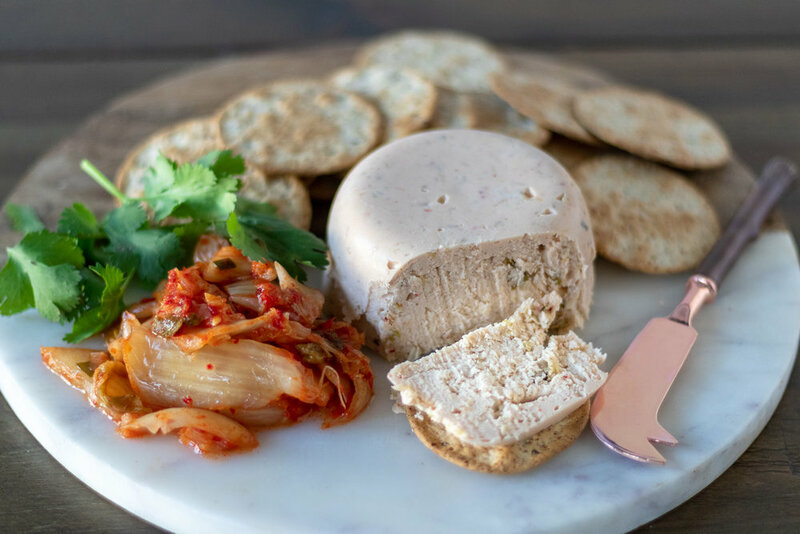 I often add sauerkraut to my vegan cheese recipes to give them that cheesy zip, and kimchi works just as well! This cheese is tangy, spicy, quick and easy, but most importantly it is DELICIOUS! Even my husband who swears he does not like kimchi, inhaled this one! This vegan cheese will shred, slice and melt, so It will work beautifully for snacking, salads, or even the best grilled cheese you may ever eat! If you can not find agar powder locally, check our pantry staples for a link to order on amazon prime! In a food processor or high speed blender, add all of the ingredients EXCEPT the milk, agar, and kimchi. Pulse until everything is all mixed up. Next, add the milk and agar powder to a medium sauce pan, and bring to a boil. Reduce heat and simmer for about 2 minutes, until mixture thickens to the consistency of a thin pudding. Add the milk mixture to the ingredients in the food processor and mix for about a minute. The mixture will quickly begin to thicken as the agar begins to solidify at room temperature. Once everything is well mixed, add the kimchi and just pulse a few times to get it all chopped up, and mixed in.